I made the point yesterday that what we’re starting to see is the re-emergence of health care as a normal political issue, along with the end fight over passing and then repealing the ACA. I think that’s the right lens through which to understand the conversation about the remaining visible problems at Healthcare.gov. as discussed by Jonathan Cohn and others. 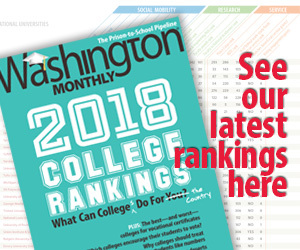 Philip Klein, criticizing the improved web site, noted that it still compares unfavorably to typical commercial sites; Cohn considers the evidence. Which doesn’t mean it won’t matter, going forward, whether Healthcare.gov is well-run or not. It’s just that it will be a normal political issue. No different from whether the VA is well-run, or whether Pentagon procurement wastes a ton of money or not. I’m confident that’s true of front-end problems. I think it’s probably true of back-end problems, at least within reason. Yes, it’s going to be a big deal for the individual people involved if a small percentage of customers have miscalculated subsidies, or if the insurance company they thought they signed up for doesn’t ever hear about it. It’s the kind of mismanagement scandal that can and should create big headaches for an administration. But it’s not the kind of thing that causes a government program to “fail” or to be repealed. Again: I’m not saying that mismanagement at Healthcare.gov is a non-issue. It’s absolutely an issue, and a big story. It’s just almost certainly a normal politics story about how well (or badly) government is working. It may even be a part of the story of the next generation of government health care reform. It’s just not part of a battle over the survival or repeal of the ACA, because that battle ended a while ago. *Is this no longer true, by the way? And is the reputation no longer true, regardless of the facts? My last experience in Texas — in a newly opened office — was just fine, and a few years ago I had an excellent customer experience in Indiana. **Old guy moment: I was going to say: just as people shop at malls even if they hate malls, because that’s where the stores are. Dated! And, yeah, maybe the miserable experience many people believed that circa-1980s shopping malls gave them had a lot to do with the demise of malls. But not before an awful lot of stuff was purchased.